When John James Fenwick opened his store as Mantle Maker and Furrier in 1882, he did so with a commitment to luxury, an uncompromising eye for quality and the passion to serve his clients with the very best he had to offer. 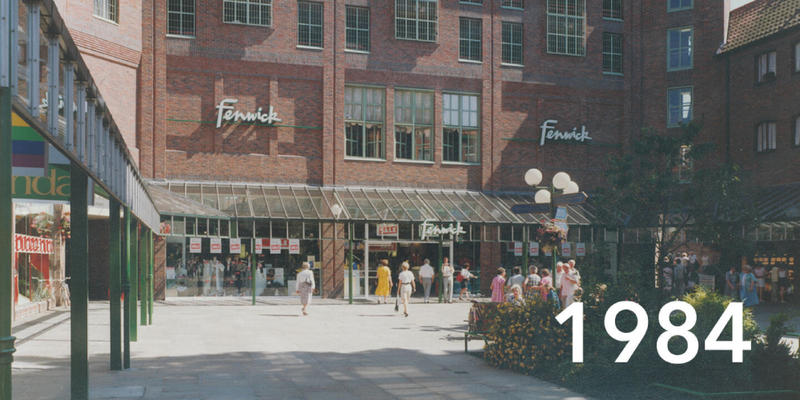 From the first day JJ Fenwick opened the doors of his shop to today, when we open the doors of nine national department stores, those same values are at the forefront of the Fenwick vision and the Fenwick experience. 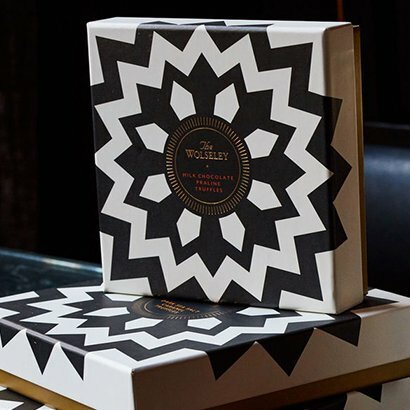 We bring you the finest selection of luxury from around the world across fashion, beauty and lifestyle, curated into a sophisticated shopping space and bestowed with in-store events, treatment rooms, bespoke services and popular restaurants. 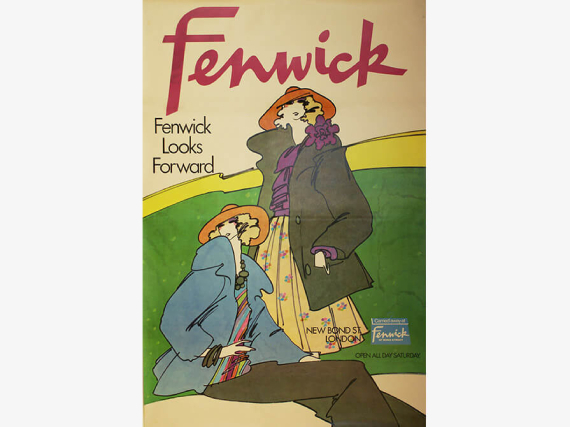 Loyal to our brilliant and British heritage, Fenwick is proudly the largest family-owned group of department stores in the United Kingdom. John James Fenwick, known as JJ, was born in Richmond, North Yorkshire, in 1846. Early in his career, he learned his trade as a shop assistant, where his passion for retail and customer service was instilled and nurtured. In 1882, his ambition came to fruition when Fenwick bought and renovated a doctor’s house for £181 and 4 shillings at 5 Northumberland Street in Newcastle upon Tyne. This would become his first store and the start of his legacy: JJ Fenwick, Mantle Maker and Furrier. Together with two assistants, he sold an unparalleled range of mantles, silk goods, dresses, fabrics and trimmings. JJ’s keen eye for luxury and exceptional care of his clientele made the store especially popular, and soon he expanded his space by purchasing 37, 38 and 40 Northumberland Street. 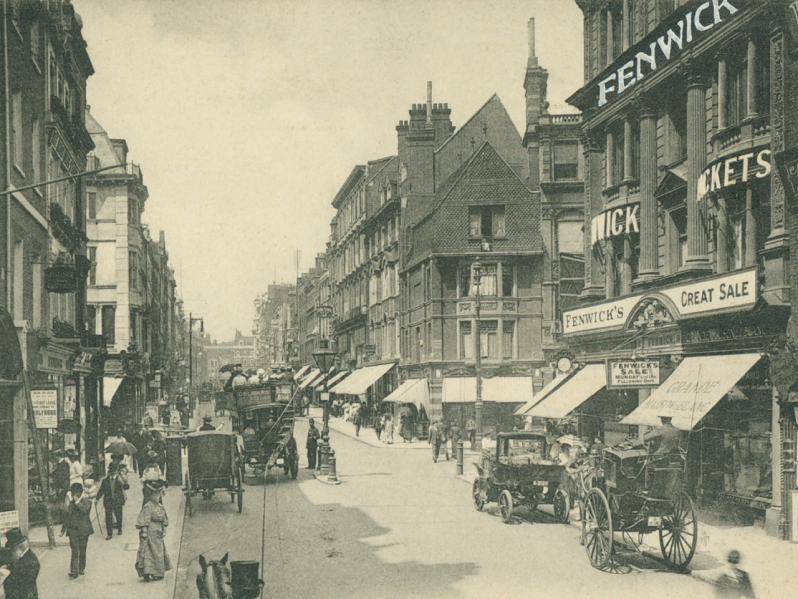 Today, the flagship Fenwick store still stands on this exact site, offering the same incomparable service, the finest products and enjoyable in-store experiences as founded by JJ over a century before. 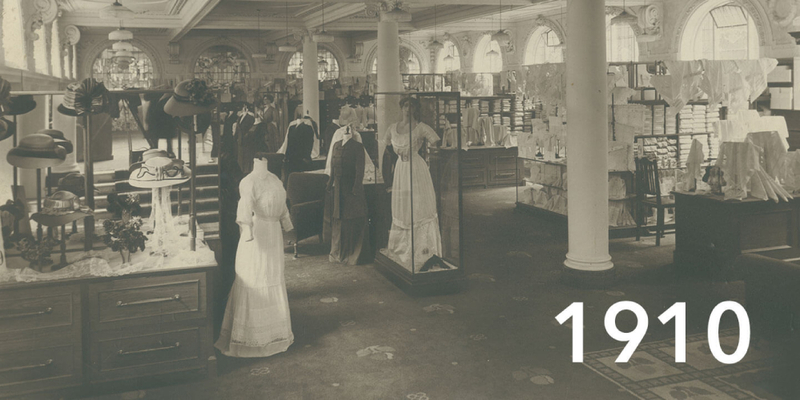 JJ’s son Fred joined the business in 1890 and was sent to Paris to train in the art of retail. 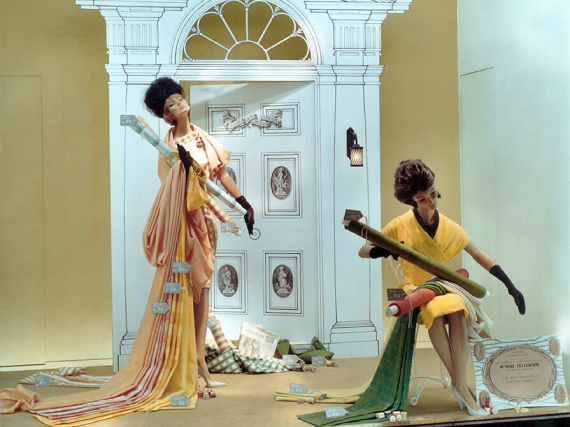 Here, he embraced the revolutionary concept of department store, perfectly exemplified in Le Bon Marché. When JJ and Fred introduced this set up to their Newcastle store, they started what would become a family-owned retail empire. With originality, relentless hard work and the highest standards of excellence, we know JJ would be proud of the nine department stores that respectfully bear his name today. 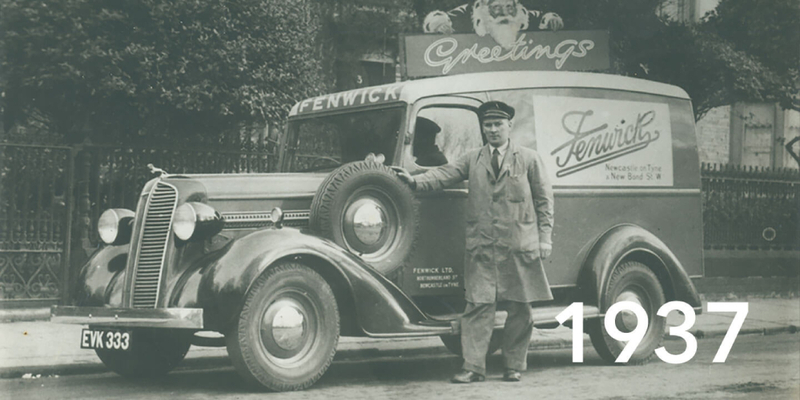 Explore the history of Fenwick from 1846 to today. 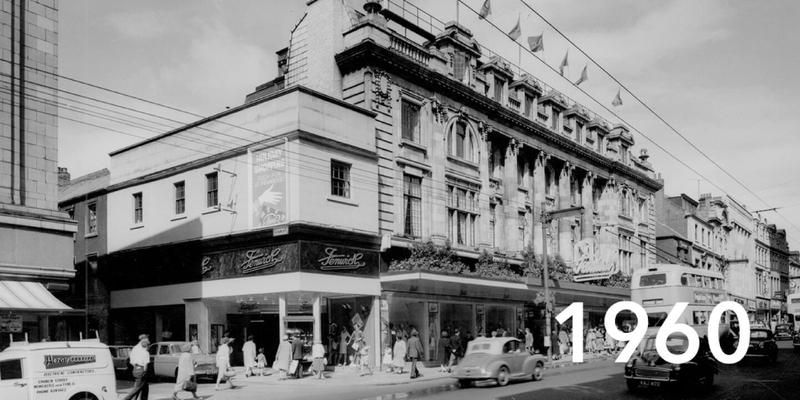 Discover how JJ Fenwick transformed one shop in Newcastle to nine much-loved department stores nationwide. John James Fenwick is born in Richmond, North Yorkshire. 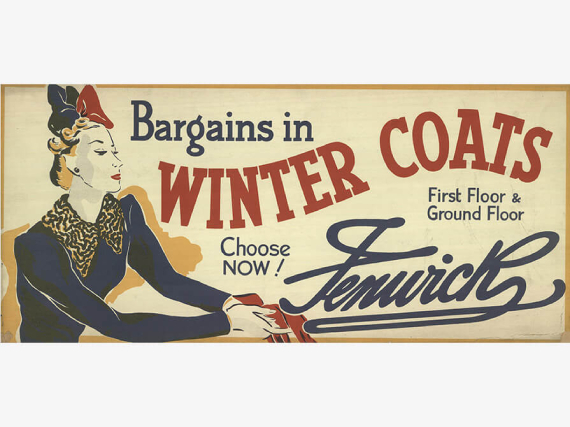 JJ Fenwick, Mantle Maker and Furrier, opens at 5 Northumberland Street, Newcastle, specialising in mantles, silk good, dresses, fabrics and trimmings, much to the delight of the well-dressed women of the city. Fenwick acquires 37/38 Northumberland Street and begins extending his shop space, product range and clientele without compromising on service or quality. 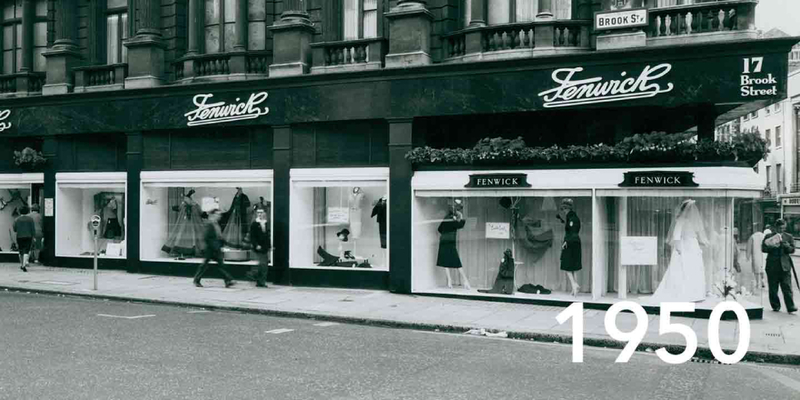 Fenwick continues his expansion by purchasing 40 Northumberland Street and his eldest son Fred joins the business. Fred travels to Paris to train in the new retailing concept of the department store and is especially inspired Le Bon Marché. Fenwick opens at 63 New Bond Street, selling women’s tailoring. 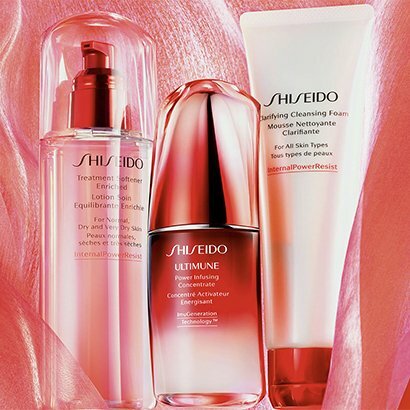 The new premises are situated in the centre of London’s luxury shopping area. 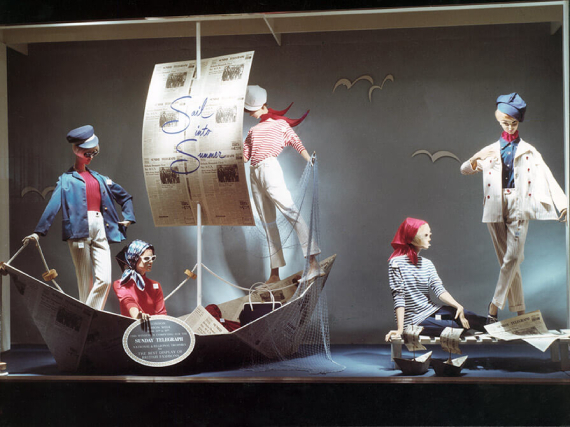 During World War II, a bomb explodes outside the Bond Street store. Though the Fenwick family were inside, none were hurt. Fenwick Newcastle debuts its first animated Christmas window display, which has since become a highlight of the city’s events calendar. Brent Cross Shopping Centre opens with Fenwick as its flagship store. 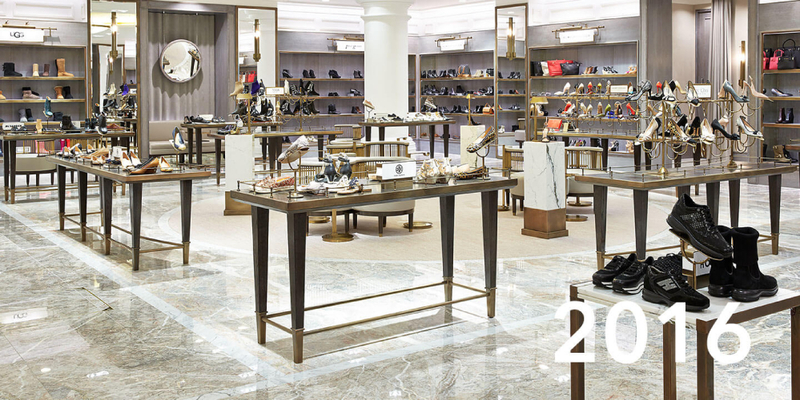 Fenwick of Bond Street doubles in size, becoming the ultimate luxury shopping destination in Mayfair. Fenwick opens in Tunbridge Wells. John James Fenwick, great-grandson of the founder JJ Fenwick, is awarded a CBE for services to retail for his 50 year career at the helm of this family-run business. The Daily Muse launches online, delivering fashion news, product announcements and lifestyle advice to its dedicated readership. 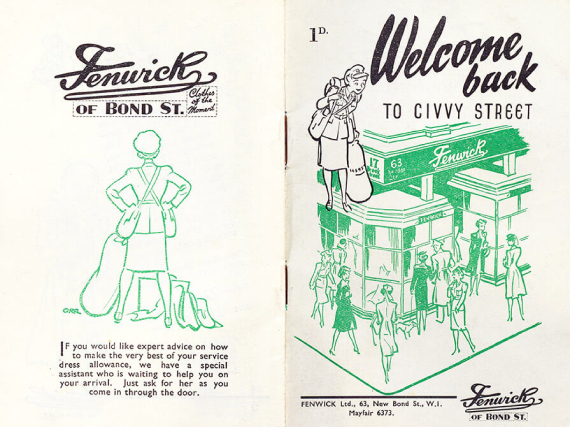 Take a look back at Fenwick throughout the ages. 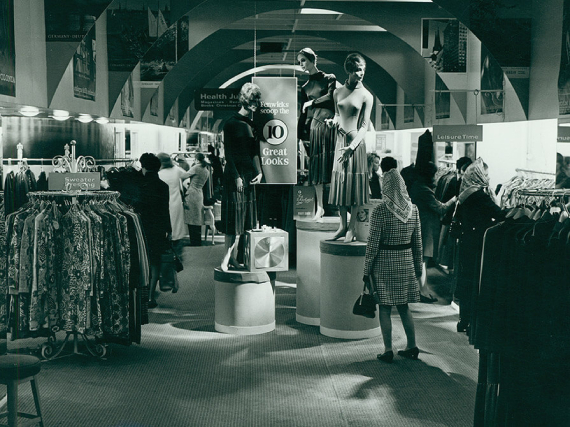 From our very first Newcastle store, when women wore corsets, men wore top hats and deliveries were made by horse and cart, through to our most recent openings, we have a rich history that has shaped who we are today. 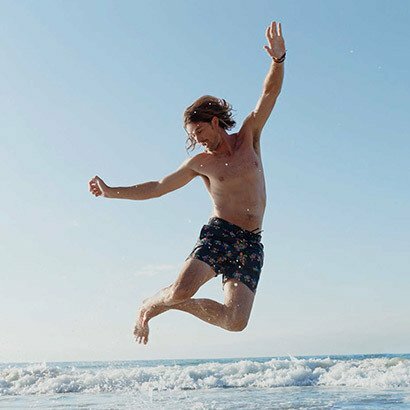 Since it first opened its doors in 1882, Fenwick has been at the forefront of luxury fashion, offering its clientele an unsurpassed selection of brands and garments for every wardrobe requirement. 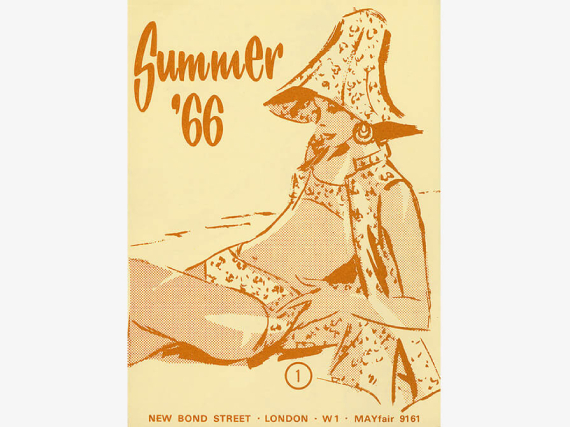 Although fashions have changed radically since the days of our first store, our commitment to finding the perfect dress, jacket, trousers, shoes or bag never has. We’ve proudly dressed our clientele for many years gone by, and we look forward to dressing them for many years to come. In 1896, actress Dorothea Baird requested JJ to design her dress for her role in the play Trilby. 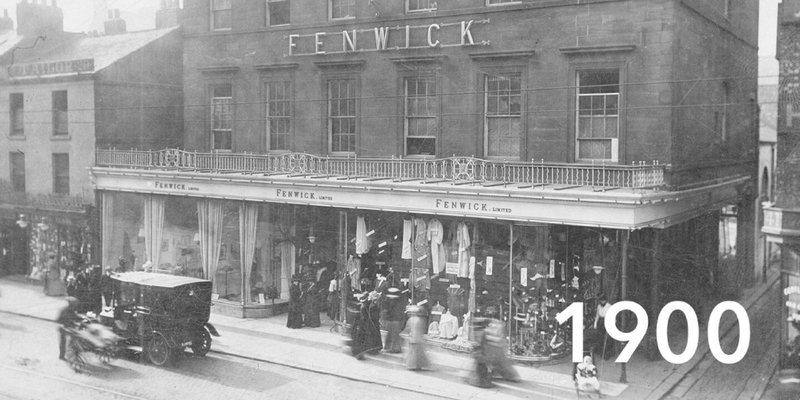 Her grandfather built 37-39 Northumberland Street – the site of the first Fenwick. Philanthropy has always been a core value at Fenwick. 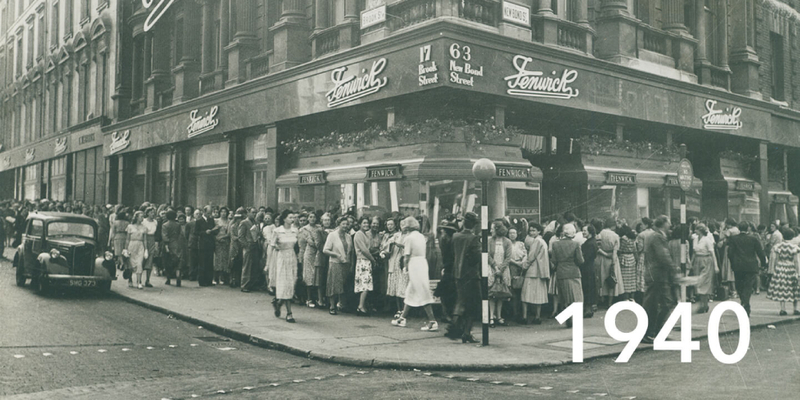 Here, we see Fenwick employees raising money on Red Cross Day in 1953, standing in front of the Newcastle store on Brunswick Place. In the 1920s and 30s, Koringa, a celebrated circus performer in the Cleo Mills Brothers Circus, was a regular at Fenwick Newcastle, often accompanied by her pet crocodile. In 1937, Fenwick advertised its ability to make Coronation robes for the ascension of King George VI and Queen Elizabeth. The illustrations show a regal gown and mantle of red and white.